BEG Group's erosion/filtration medium, Big SwitchTM, is a sturdy, polypropylene geotextile (woven) fabric that has been engineered specifically for controlling erosion and containing and/or retaining sediment in disturbed areas. A mesh tube filled with bio-based material that is placed perpendicular to sheet-flow runoff., Big SwitchTM (which is oval to round in cross-section), provides a three-dimensional filter that retains sediment and other pollutants (e.g., suspended solids, tannic acid, nitrates, phosphates and more) while allowing clean water to flow through. Big SwitchTM can be used in place of traditional sediment and erosion control tools such as a silt fence, straw bale barrier and woodchip/mulch socks. The CEGEN Power Generation Unit uses proven “wind” technology to capture and convert compressor cooler exhaust into electricity. By capturing the continuous exhaust exiting coolers and redirecting it through its unit, the unit can produce a minimum of 6 to 8 kW/hr on a 1500 hp compressor package. The CEGEN Power Generation Unit has a turbine mounted inside the CEGEN duct extension that is orientated in the exhaust of the heat exchange cooler. When exposed to the exhaust, the turbine rotates, turning a wind turbine motor and generating electricity. PetroMar’s new FracViewTM product is a Logging-While-Drilling (LWD) Acoustic Borehole Imager and the only commercially available solution for obtaining low-cost, high-resolution borehole images while drilling with any mud system, including oil-based and synthetic-based electrically non-conductive muds. Such borehole images provide valuable geophysical information with respect to viewing fractures, faults, bedding, and lithological facies, as well as stress indicators such as borehole breakout (including incipient breakout) and drilling-induced tensile fractures. This information can play a very important role in planning optimal well completions in shale and other unconventional reservoirs, and is now commercially available at a total cost point that allows for obtaining it on every lateral. Quiet Professional Solutions, LLC, provides state-of-the-art detection surveillance systems in common construction devices (barrels/barriers). These systems can be remotely accessed and trigger alarms as well as record to both internal and external devices. The systems can be powered from battery/solar/shore power. Simtable's flagship product is an interactive, 3D physical sand table for projecting real-time surface and subsurface GIS and video feeds. Simtable is a standard in training, incident command and community outreach in the wildfire community and the broader emergency management field. All information is bi-directionally available in the field via distributed web applications, allowing information to flow seamlessly in real time across agency boundaries, to news outlets and directly with citizens. Real-time situational awareness can be fused into a 3D interactive model with specific and secure layers of permissions. The Pipe Slip Prevention System uses a combination of the TriAx geogrid and the Uniaxial geogrid under and above the pipe to prevent backfilled soil from sliding down the trench and causing catastrophic failure. The geogrids, which are connected to improve the safety of the trench, are made from polypropylene and polyethylene, respectively, and are completely inert for chemical degradation. MyShaleWellTM is a SaaS (Software-as-a-Service), cloud-based, logistical platform to manage shale gas well sites, including complete well site logistics and a marketplace to connect key providers and services essential for productivity and efficiency of workers, processes, materials, equipment, monitoring, training, safety and security. Learn more at www.myshalewell.com. The Sonic Sensor uses acoustic measurements to detect the concentration of harmful gases by sampling the surrounding air through a patent-pending, flow-through acoustic chamber design. Using the latest in wireless mesh technology, a wireless network of multiple sensors generates lab-grade gas concentration measurements that can be used to monitor infrastructure and detect and locate harmful gas leaks. The shale industry was made possible by horizontal drilling and hydrologic fracturing, which created an ongoing demand for technologies to support enhanced productivity and environmental compliance. Dr. Ziemkiewicz will discuss how those demands are being met concurrently with rapid production scale-up, utilizing a case study focusing on the role of successful government- assisted, market-driven technology development. He will highlight the role of the USDOE/NETL Marcellus Shale Energy and Environmental Laboratory (MSEEL). 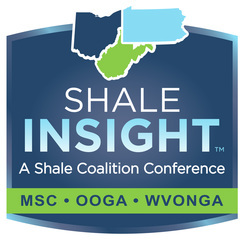 ​Marcellus Shale Energy and Environment Laboratory (MSEEL) will share the results of its work on understanding the significance of healed fractures to completion efficiency by integrating image logs, micros-seismic, slow-slip fiber-optic monitoring and production logging. Marcellus Shale Energy and Environment Laboratory (MSEEL) will share the results of its work on powering the prime movers of unconventional natural gas well development with dual fuel and dedicated natural gas engines. Factors to consider include understanding the impacts on regulated emissions, efficiency, costs and more. Marcellus Shale Energy and Environment Laboratory (MSEEL) will share the results of its work on the influence of micro-biogeochemical reactions on well infrastructure and production, including geochemical and genomic tools used to understand microbe/water/rock interactions that can plausibly enhance gas production or have detrimental effects on gas flow and well infrastructure.